Arborglyphs are carvings on trees that record names, dates, images, stories and even poetry. In Tahoe, aspens were the trees of choice preferred by the Basque artists, or sheepherders, who inhabited our area in the early 1900s. The smooth bark and light color made the perfect canvas for carving, and artistically preserved a slice of our history and a unique western cultural phenomenon. 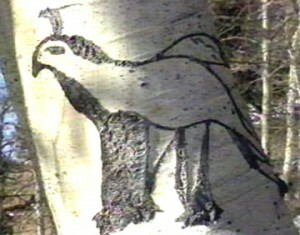 The Basque sheepherders carved on thousands of aspen trees to pass the day in the “high country” in ten western states. Luckily Lake Tahoe and the surrounding area is home to this unique art form. Historians have been studying tree carvings to gain historical, cultural, and ethnic insight into North America’s past. In our region, the arborglyphs were made by the Basque sheepherders who roamed the mountains and valleys of Nevada. The carvings are considered both folk art and recorded history that documents their way of life. If you want to know when and where sheep grazed or who the sheepherders were, chances are only arborglyphs could provide answers. Though carving was a widespread activity, the sites were remote and often the trees died before their messages from the past could be recorded. The arborglyph is a botanical relic that has a limited life span. Today, there are very few left dating before 1900, since aspens only live about 100 years. Basque immigrants from the Pyrenees mountains between France and Spain came to the United States between 1860 and 1930. They, more than any other ethnic group, are being studied using arborglyphs carved over the last century. Dr. Joxe Mallea, a Basque historian and an expert on Basque arborglyphs, organizes tours to sites in our area. Tree carvings have never been studied in such detail as the “glyphs” being documented by Dr. Mallea (over 20,000 arborglyphs to date). “It can be said that the Basque sheepherders contributed more to the practice of tree carving than any other group in the western United States. Indians, trappers, early explorers, scouts, and prospectors spent considerable time alone in the wilderness, but did not record their names and movements on trees or rocks like the Basques did,” says Dr. Mallea. 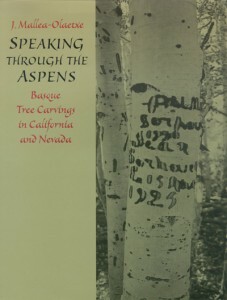 Dr. Mallea has also written a book, “Speaking through the Aspens” dedicated to this phenomenal art form and historic mountain culture.